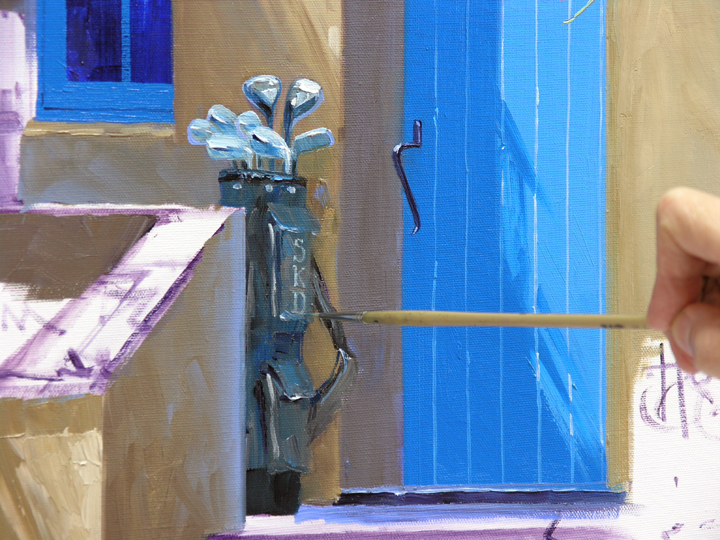 Now to get started on paintings for my Collector Event in Santa Fe. Our theme this year is Travels. 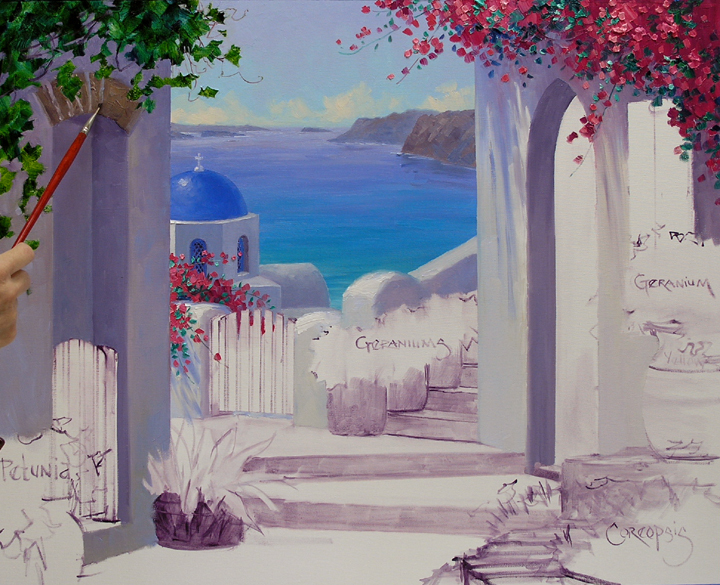 Since we had such a great response to the commission painting A Touch of Greece I decided that I would do a Santorini piece for my show. The basic plan is sketched up on the canvas. A soft summer sky is made with a few clouds lazily drifting on the horizon. The distant islands are cooler and lighter in value, making them fall back. The closest island is made a little warmer to bring it forward. The color of the ocean is duller toward the horizon, becoming brighter and more intense as it gets closer to the viewer. The dome of the Church is a crisp Cobalt Blue. The shadows of the building are made bluer, or cooler so it will drop back down the hill. Even the white highlight on the left side of the Church has a touch of blue added to make it fall back. Warmer whites are used for the wall along the foreground walkway so it advances forward from the background building. The highlight here is pure White. 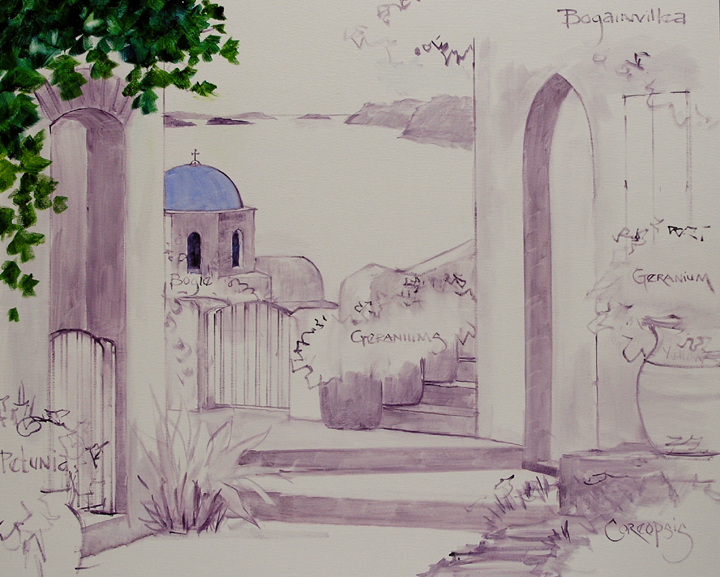 Bougainvilleas are everywhere in the Greek Islands. Permanent Rose + White is used for this pink specimen with its long reaching arms. A little Magenta is added for the bracts in shadow. Flowers are painted first, then the greens of the leaves are worked around the areas of pink. 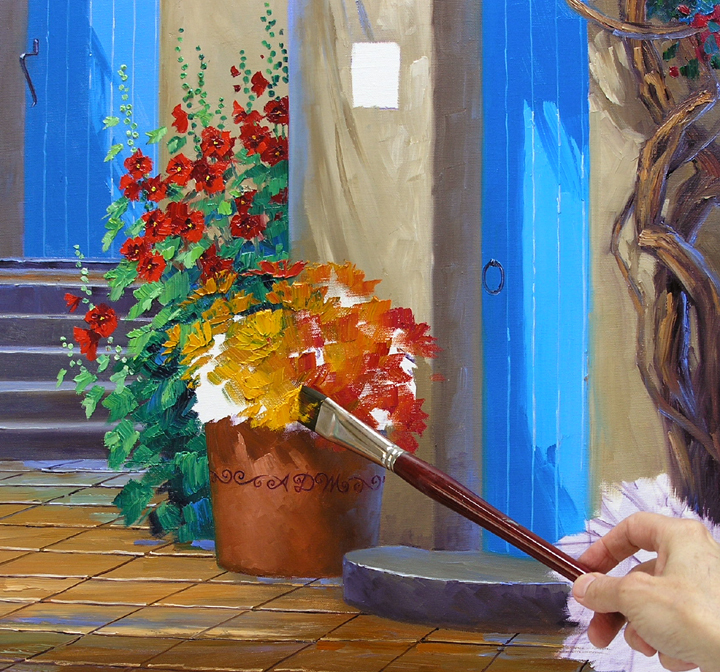 Painting in this sequence keeps the blossom color clean. 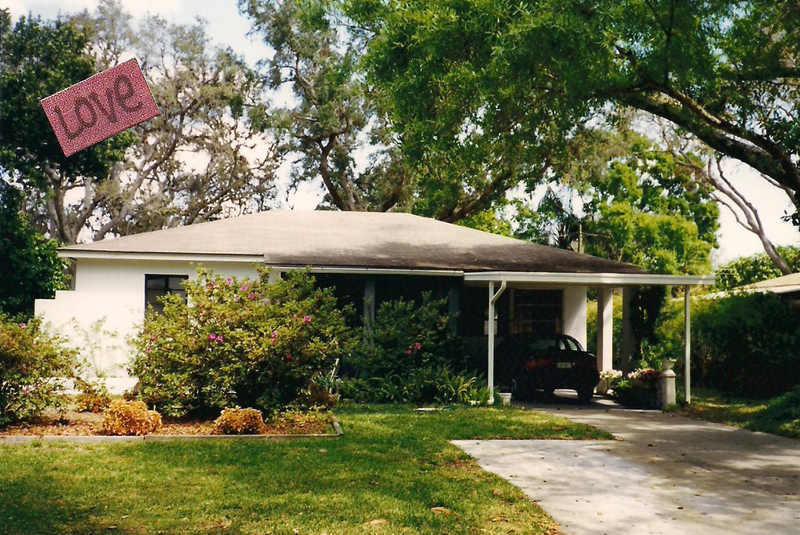 The driveway is painted with some of the color leftover from the roof. Making the pavement cooler, or bluer, toward the back and warmer in the front helps to give the impression of depth. 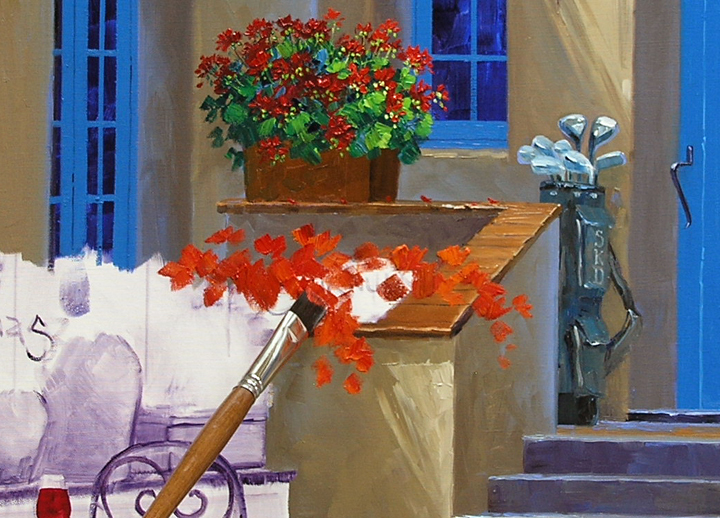 Warm colors come forward, Cool colors recede is another of those simple rules we artists follow. 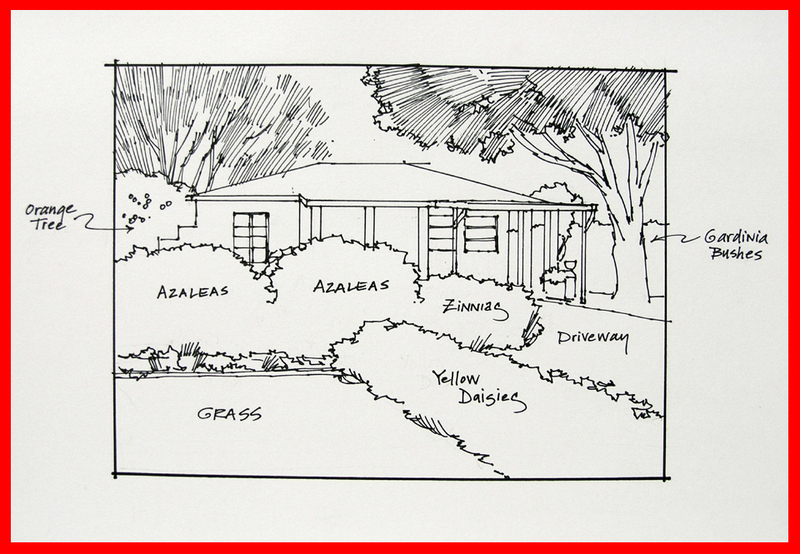 This same concept is used on the lawn, the green grass is cooler in the back near the Azalea bed. 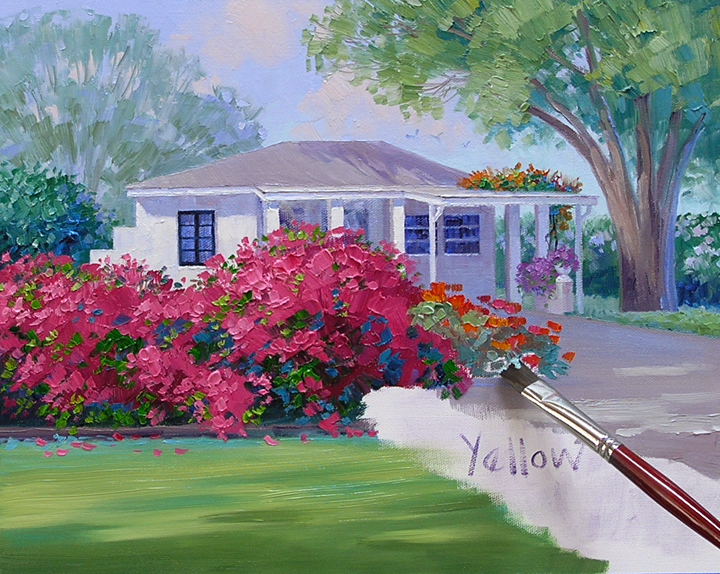 The prize Azaleas are fun to paint. Mixes of Permanent Rose + Magenta + White are used for the shadows while Permanent Rose + White makes the blossoms in the light. After the bright pink flowers are blocked in the leaves are painted. 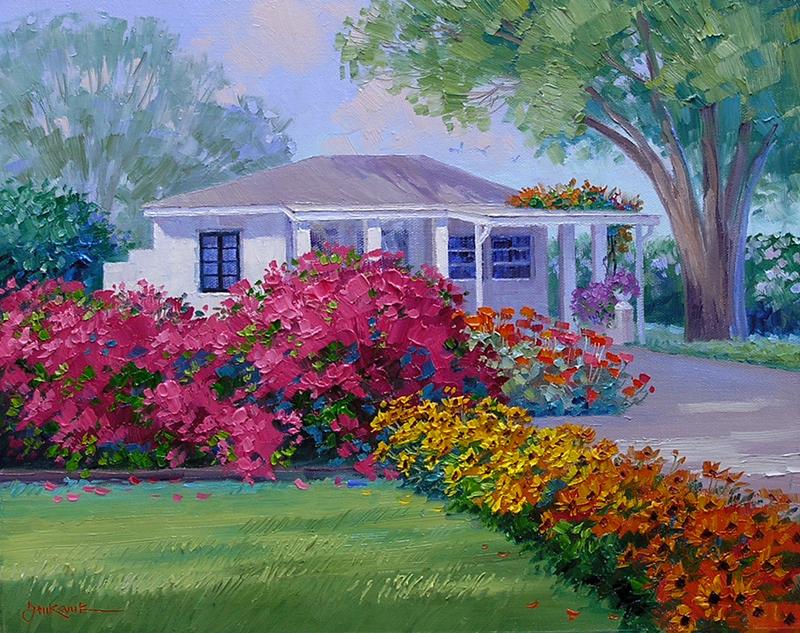 The Azaleas act to frame the window on the left side of the house. This was Matt’s mother’s bedroom when she was a little girl. A bed of Zinnias slightly behind the Azaleas catch the sunlight streaming across the yard. 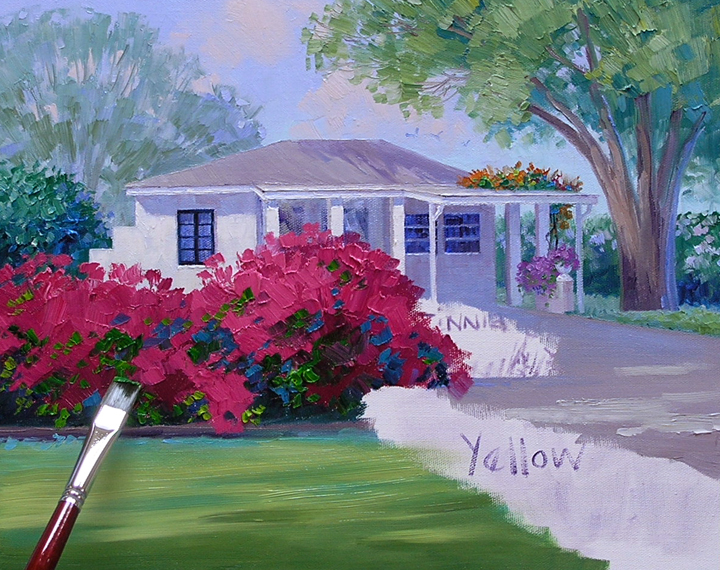 These are painted in the same sequence as the Azaleas, Flowers first, leaves last. Let’s get to work. The entire area of sky is painted first with Ultramarine Blue + White toward the top and a lighter mix of Pthalo Blue + White toward the bottom. The clouds, made of White + Cadmium Orange + Ultramarine Blue, are lightly dragged over the blue which softens the edges. Then the distant tree is painted over the sky with cool greens, keeping the edges soft to make it drop back into the distance. Soft edges recede, Hard edges come forward. 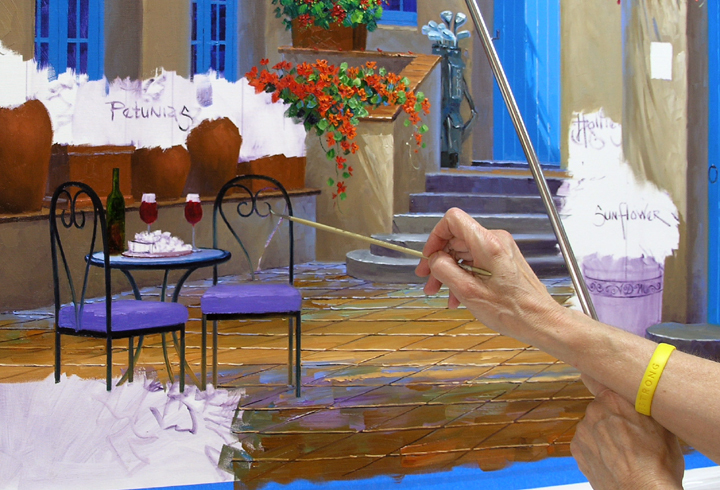 This is one of those simple rules that helps artists to give the appearance of depth in a painting. 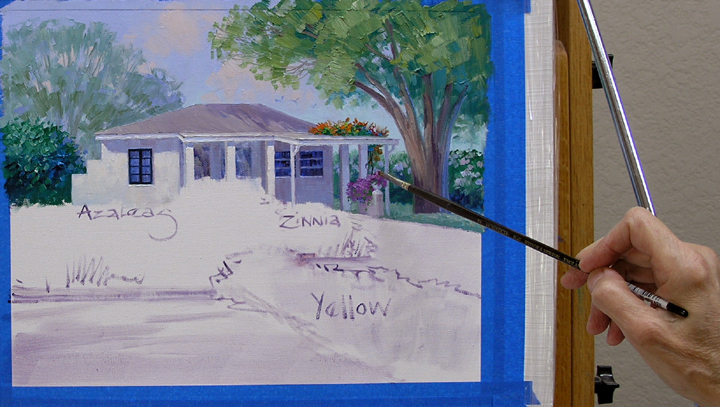 After painting the foreground tree with brighter, darker greens to make it come forward I start to work on the house. I let the shadow from the tree fall on the right side of the roof. This darkens the light gray roof so it is more visible against the sky. Gardenia bushes, favorites of Matt’s mom, line the yard behind the tree on the right. A vine is growing over the carport, I’ve added some flowers for interest. Next I move to the Orange tree at the left of the house. Matt and his mom have fond memories of eating the sweet, juicy fruit. I thought my next painting was going to be one of the pieces for my Collector Event in Santa Fe but I got a surprise commission to do. This will be for a birthday that is quickly approaching so I better go ahead and work it in first. 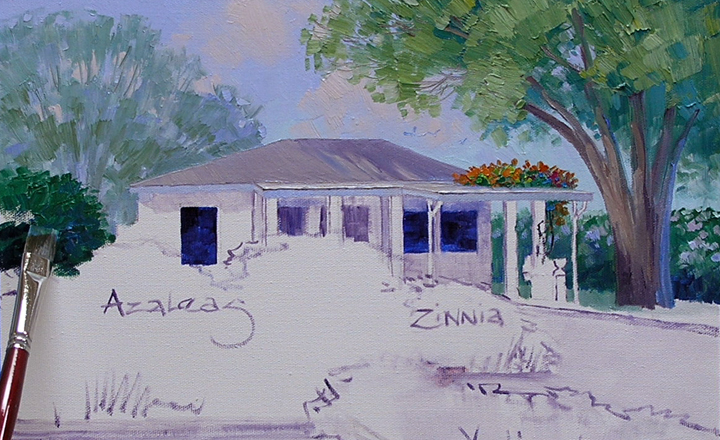 Matt asked me to paint his mother’s childhood home, pictured above, for her present. 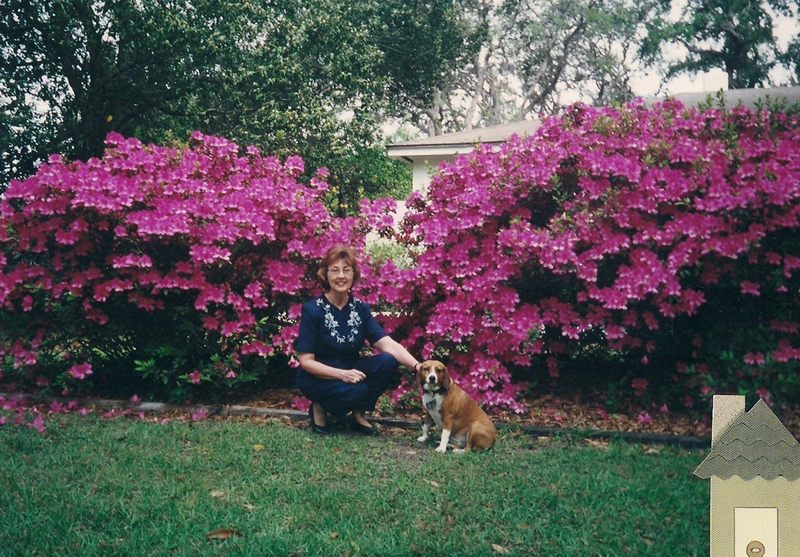 Her mother’s prized azaleas were the envy of everyone in the neighborhood, we definitely want to show them in full bloom. Matt’s mom also loves Zinnias, Gardenias and any type of yellow flower. He also asked me to show a few birds flying in the sky with some soft clouds. So here is the sketch. Taking some artistic license I’ve done a little landscaping in the front yard. Yellow Daisies border the driveway and a bed of Zinnias will be planted to the right of the Azaleas. To see any of these images larger just click on the picture. I draw the basic elements on the canvas with a brush dipped in a thin oil wash of MUD (Ultramarine Blue + Alizarin Crimson) + Liquin. 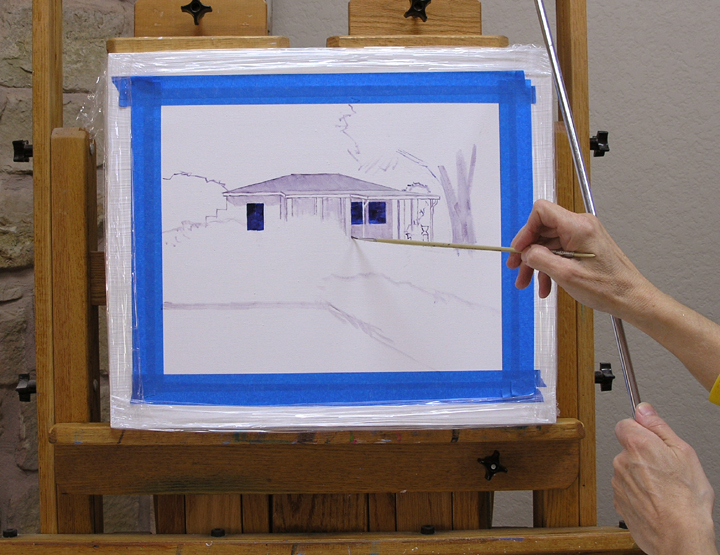 Drawing the house I brace my wrist on a Mahl stick that hooks over the top of my easel. This keeps my hand steady so I can delineate the details. 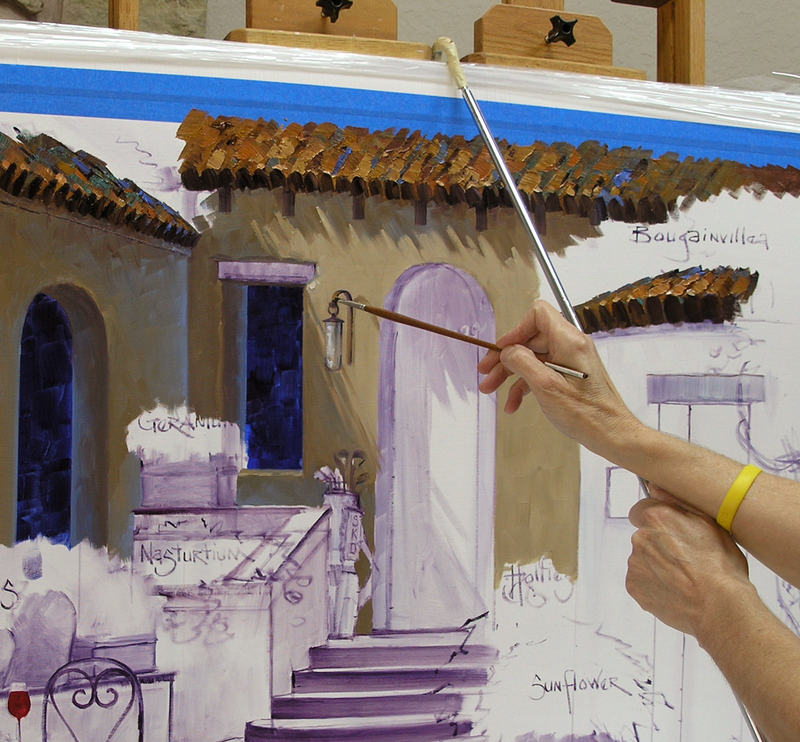 It is important to take the time to get all of the proportions correct in this step. It is much easier to make changes now than to wait until later. 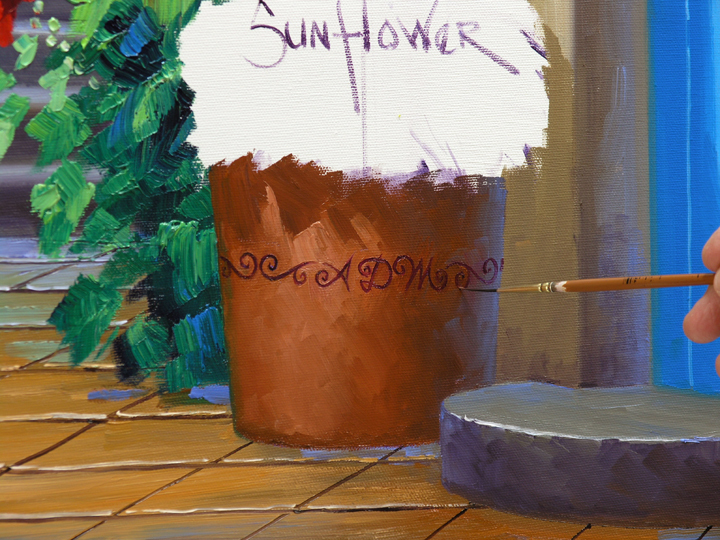 The basic yellows of the Sunflowers are Cadmium Yellow Medium and Cadmium Yellow Medium + Cadmium Orange + a little bit of MUD (Ultramarine Blue + Alizarin Crimson). I also bring some of the reds from the Hollyhocks into the shadow side of the cheery blossoms. The broad leaves are painted and the petals touched by the sun are highlighted with a mix of Cadmium Yellow Medium + Hansa Lemon Yellow. Then the large, dark centers are added to the Sunflowers. I haven’t forgotten the third daughter, Molly Rose. This tile is for her. To see it larger just click on the picture. 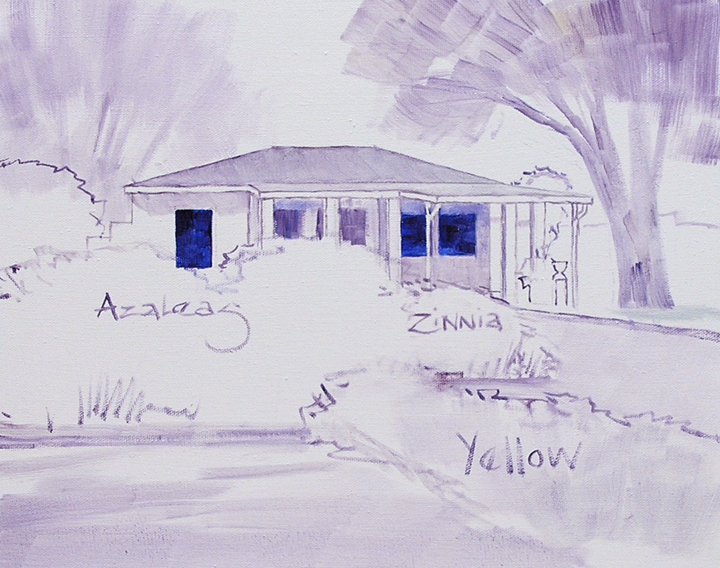 Shapes come into play when designing a painting, much like in landscaping and gardening. I had originally planned an agave by the blue gate but somehow the sharp, spiky shape doesn’t seem very welcoming. However, I don’t want a plant that has a round configuration similar to the Sunflowers and Petunias. A Salvia, or Mexican Bush Sage, with long, slender blossoms and soft leaves fits here perfectly. The purple also looks really nice with the blue gate. Wine, cheese and fresh grapes are set out for Frank and Sarah to relax and celebrate their family. The grapes are painted with colors left over from the Hollyhock leaves. The Geraniums are planted and then the blossoms of the Nasturtiums are made of different proportions of Cadmium Red Light + Cadmium Orange. I allow tendrils to drape over the wall, softening the hard edge. A mix of Pthalo Blue + Cadmium Yellow Medium + White is used to complete the distinctive round leaves of the Nasturtiums. Next the adobe wall and row of containers for the Petunias are painted. 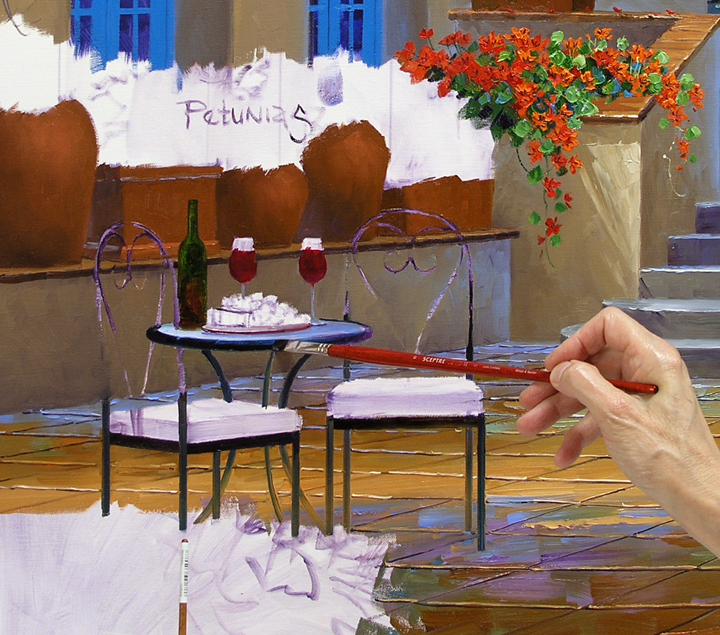 It is much easier to draw the table and chairs wet into wet over the background. 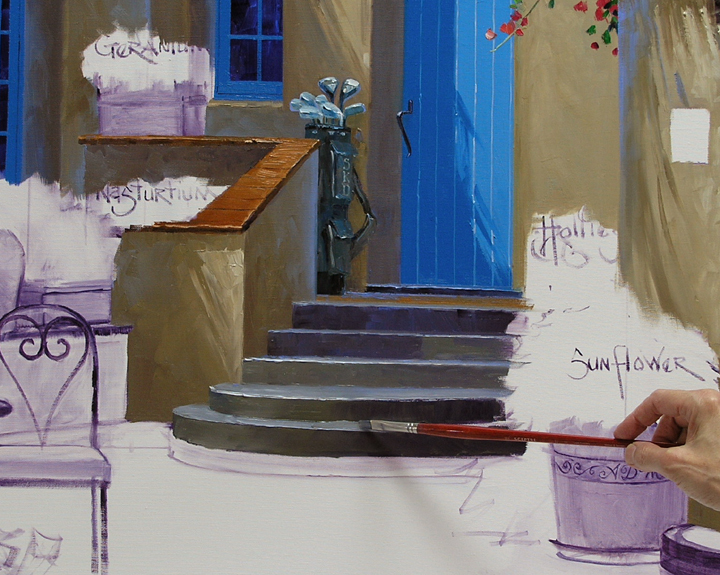 The wrought iron is made with a mixture of Alizarin Crimson + Pthalo Blue. This makes a rich black that has a blue highlight when a bit of white is mixed in. The heart-shaped chairs for Lara are drawn with a #0 Filbert brush. 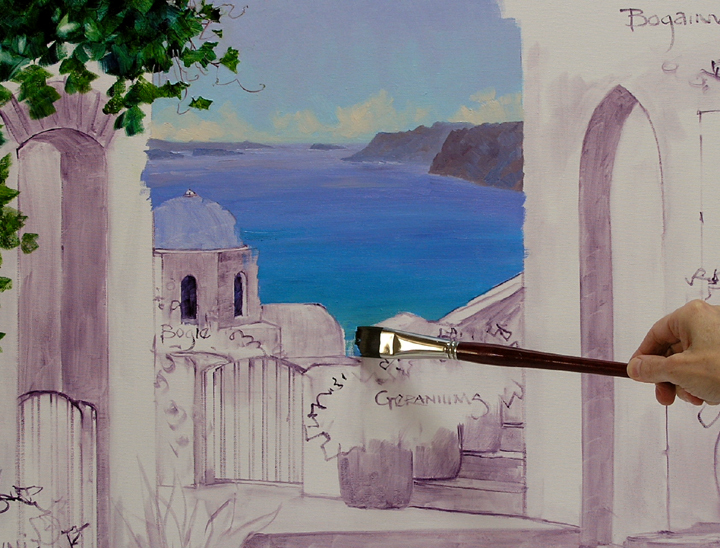 Bracing against the mahl stick and holding the brush at the end gives more control. I know this sounds ridiculous but if the brush is held close to the ferrule every jiggle and shake of your hand is transmitted into the line. Grasping the handle at the very end makes all of those bumps and jerks go away! That’s one of the reasons they make long-handled brushes. The Petunias filling the row of pots are painted in my usual sequence, Flowers First, Leaves Last. 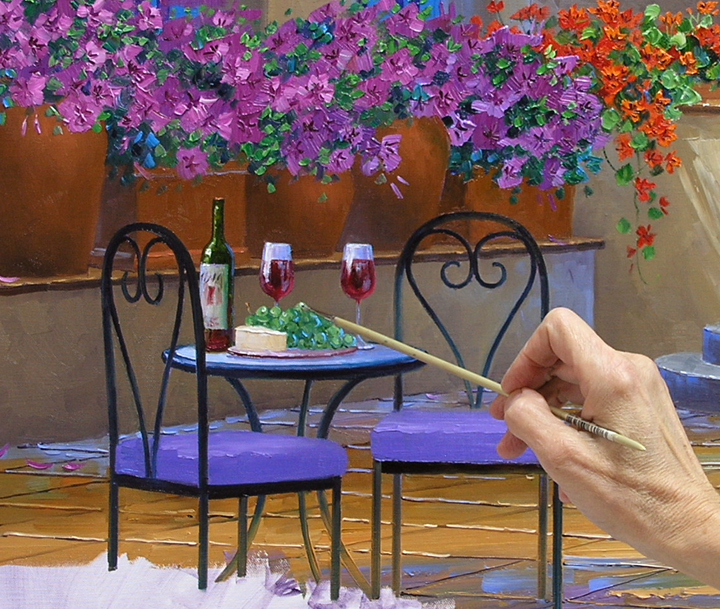 After the foliage is complete a thin mix of Magenta + Liquin is used to add the centers of the flowers. Rules, rules, rules. Here is another simple rule that helps give direction when painting steps: Flat planes are lighter, Upright planes are darker. Since the main light source, the sun, is coming from above the tread of the step receives more illumination and is lighter. The riser, or upright side, is darker because the light doesn’t hit it directly. The dark sides are painted first, then I come back and delineate the flat surface of the treads. Now for the courtyard pavers. The entire floor area is covered first, establishing the light and shadows. The distant part of the floor is made cooler, or bluer, so it will drop back. 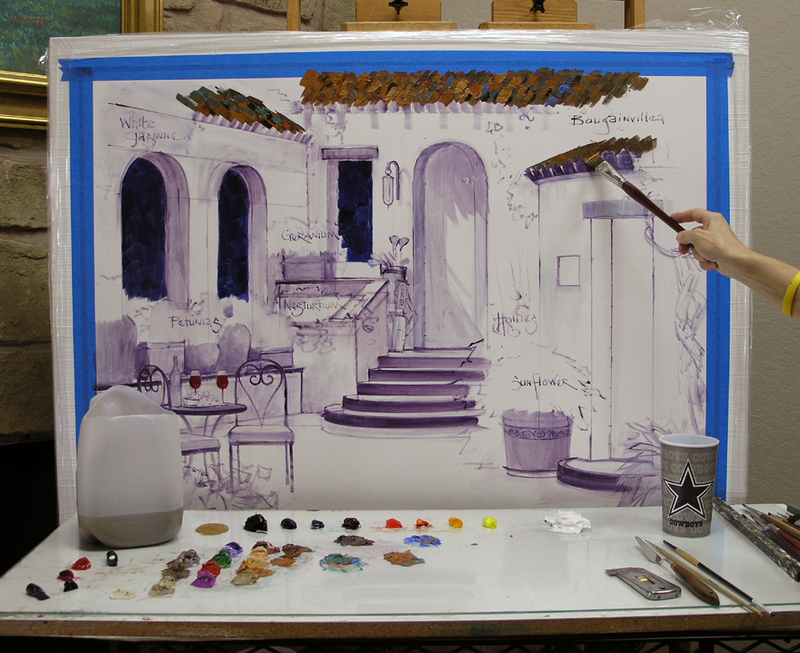 Perspective lines are drawn into the wet paint with a fine liner brush. This really helps to give the piece depth. If you would like to enlarge the picture, just click on the image. The horizontal lines separating the individual tiles are now indicated. This is all done freehand, using the mahl stick for support would limit the movement of my hand and I couldn’t make a smooth line. The back edge of the curved wall on the right is made cooler, or bluer, so it will turn back. Moving forward warmer colors are used. The wall to the left of the door is highlighted, while that to the right becomes darker. This helps to give the appearance of roundness. 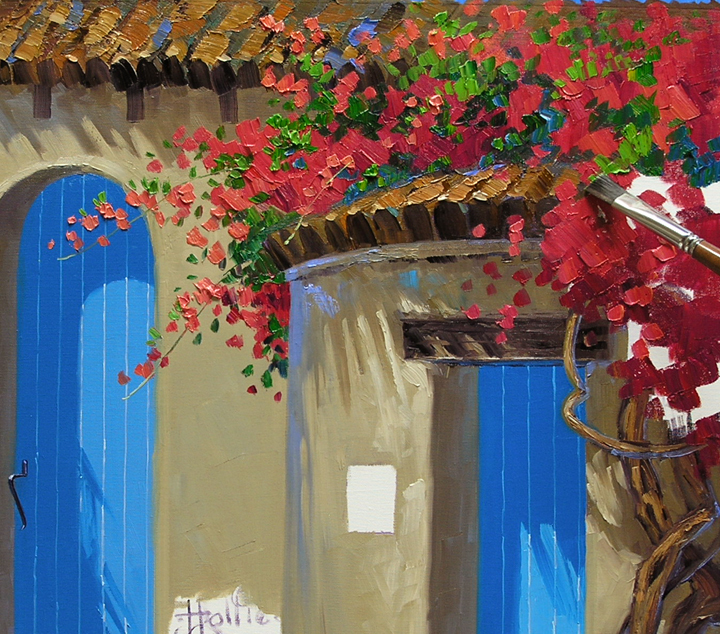 The twisted, gnarled trunk of the Bougainvillea is fun to paint. Two groups of blue are mixed for the door, windows and gate. 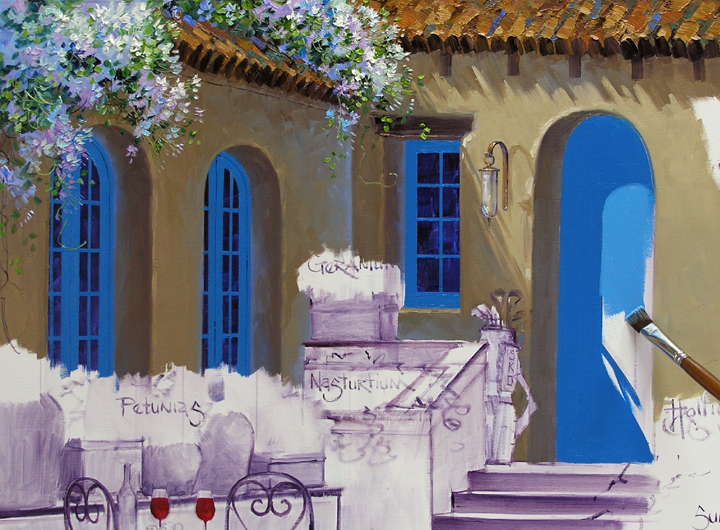 Pthalo Blue + White is the basic mix. The two blobs on the left have a tiny touch of MUD (Ultramarine Blue + Alizarin Crimson) added to make them a little duller. The brighter, pure mixes at the right will be used for the foreground gate. The duller shades of blue are used for the distant windows and door. 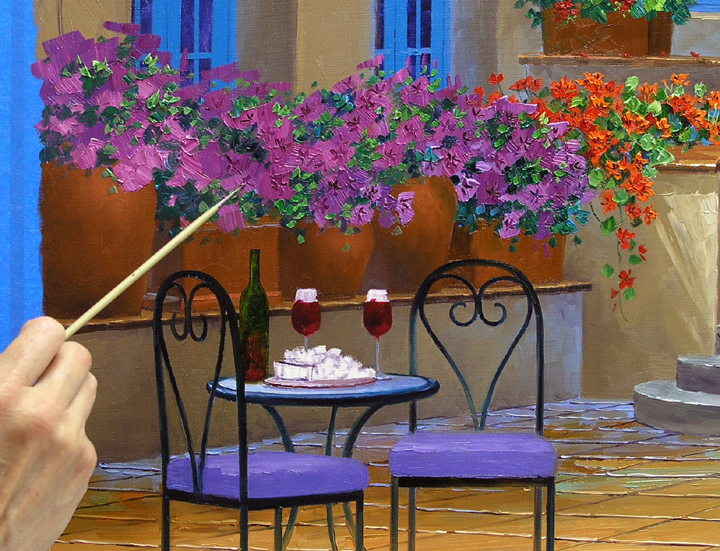 This is another one of those rules that help to give a painting depth: Bright Colors come forward, Duller Colors go back. The brighter blue is used on the foreground gate. Can you see how it appears closer than the door behind? Now, let’s talk really BRIGHT! 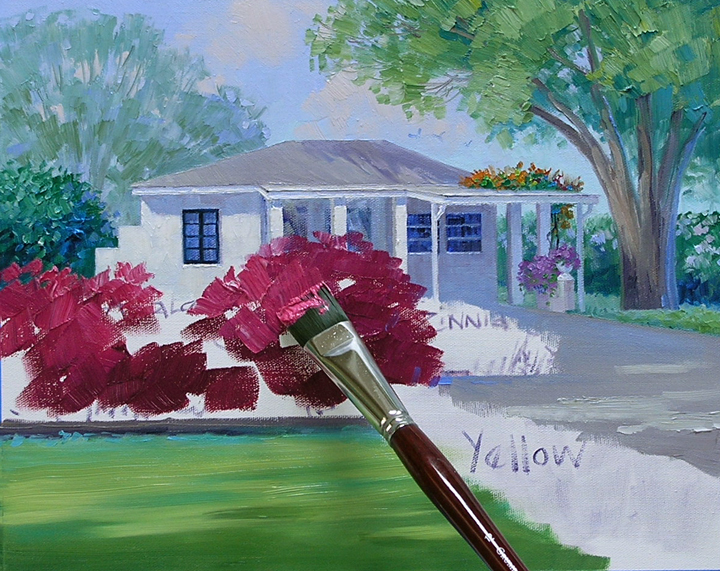 I’ve got my paint mixed for the Bougainvillea. 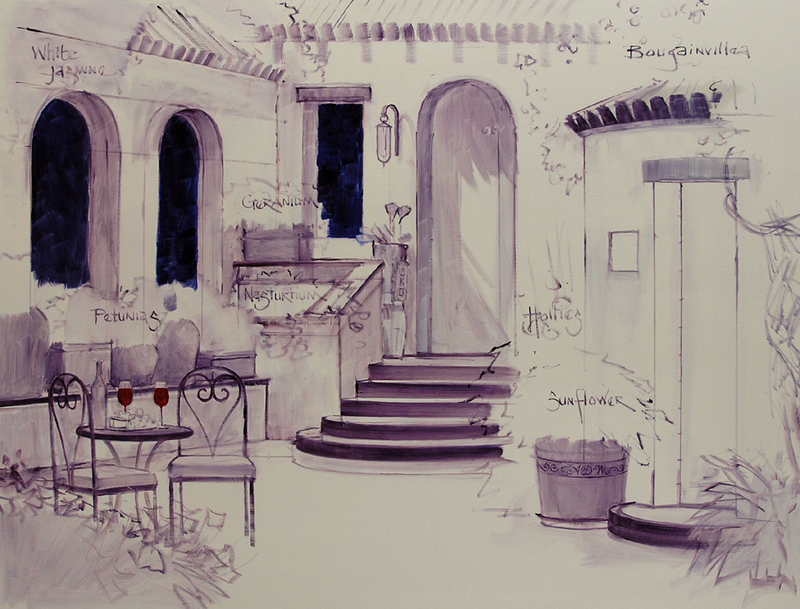 Various proportions of Cadmium Red Light + Permanent Rose + White make the brilliant hue. 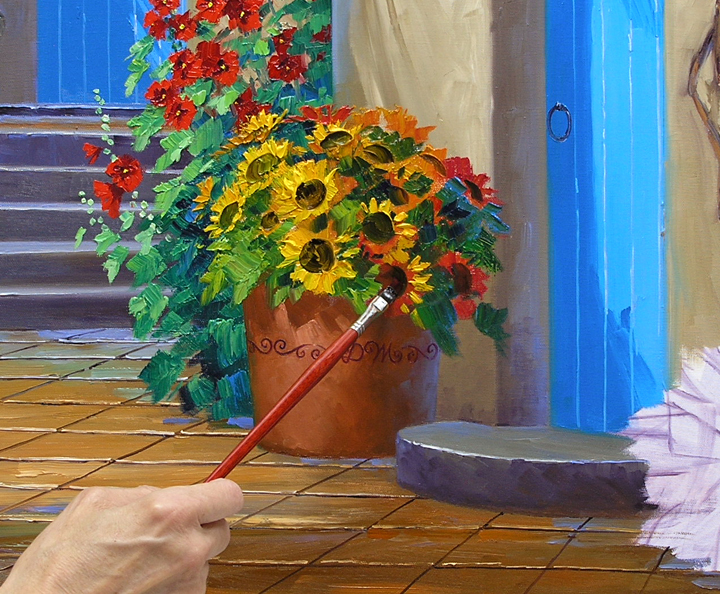 The flowers are blocked in with a large Bright brush. 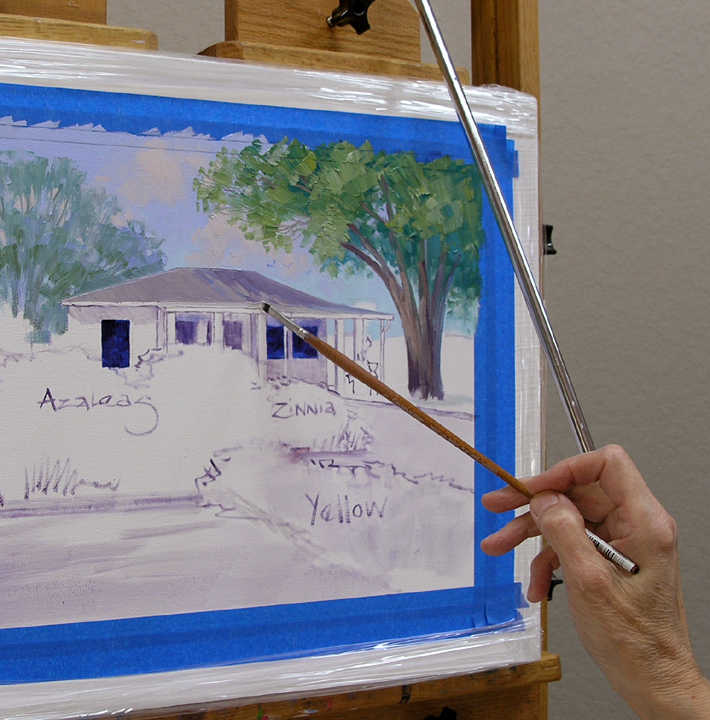 The leaves are made of Pthalo Blue + Cadmium Yellow Medium. 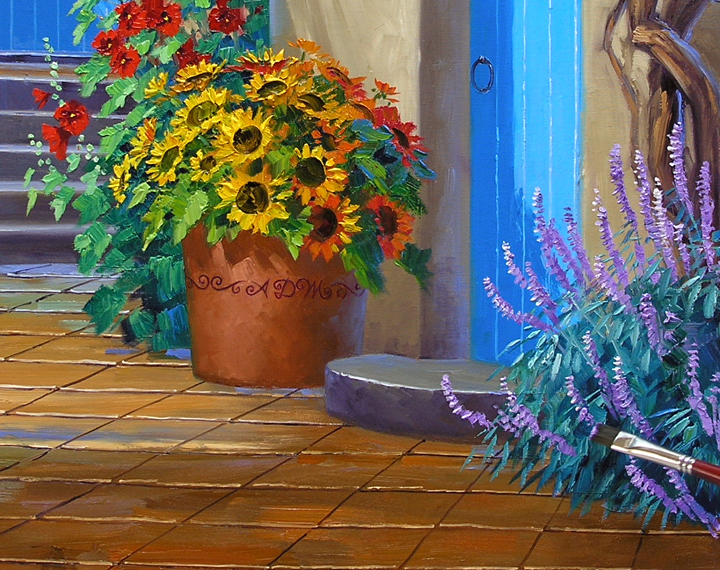 A few strokes of the dark blue from the distant door is worked into the foliage to add interest and coolness. 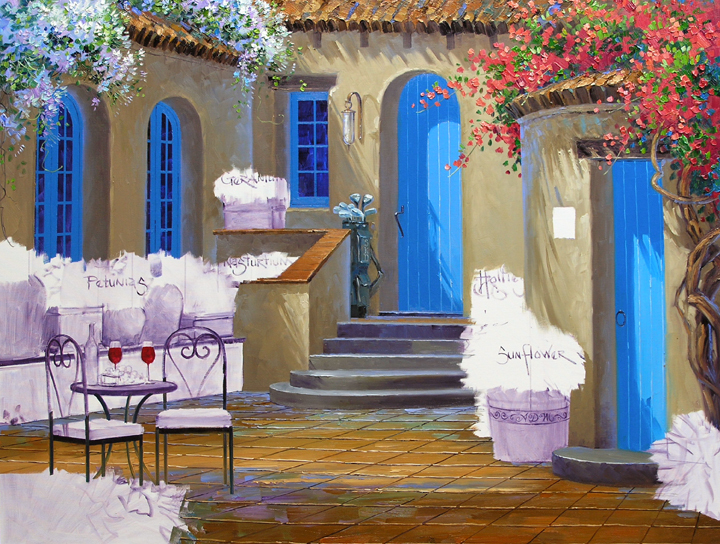 The long streamers of the Bougainvillea reaching in front of the background door also give depth to the piece. 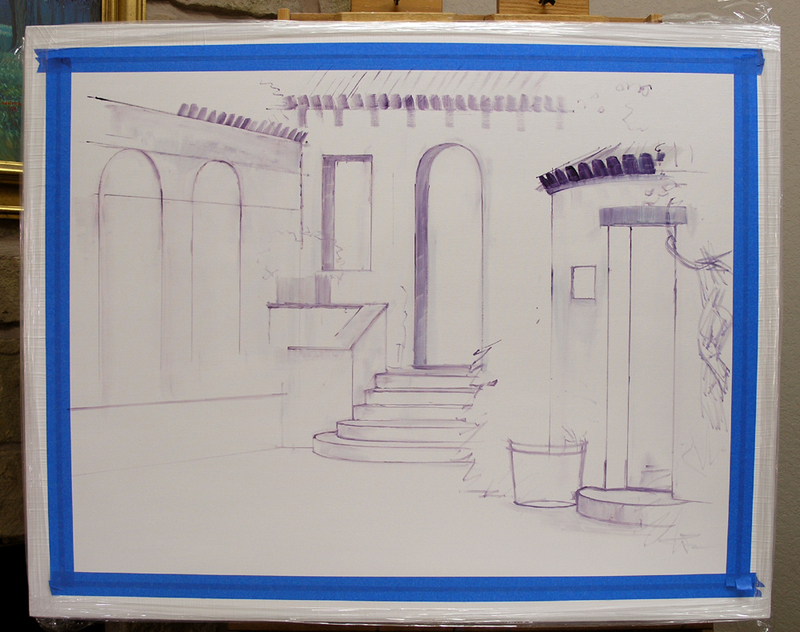 In the initial sketch I had originally planned to have some large, leafy Banana trees behind the wall. I’ve left them out because they would make it too crowded. First of all Jack and I want to open our hearts to all of those touched by the shootings in Colorado. It is hard to even begin to comprehend how someone could do something so awful. We have you in our thoughts and prayers. Remember all that paint I saved from my previous painting? Well, it is perfect to use for the old roof, the various colors give the feel of the weathered clay tiles. Since it has sat a couple of days the paint is a bit thicker, giving a really nice texture. New paint is mixed for the stucco walls. 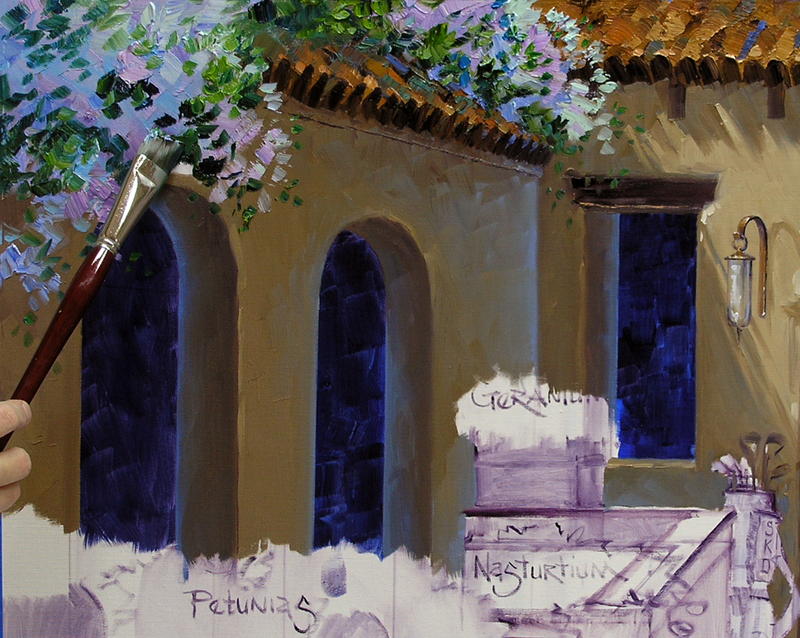 The adobe color is made of various combinations of Ultramarine Blue + Cadmium Orange + White. 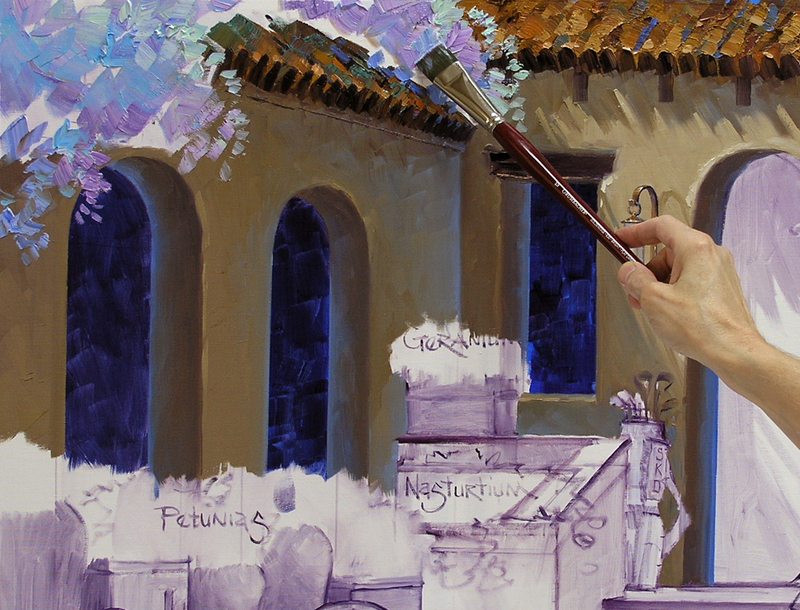 MUD (Ultramarine Blue + Alizarin Crimson) is added into the darker mixes for the shadow areas. 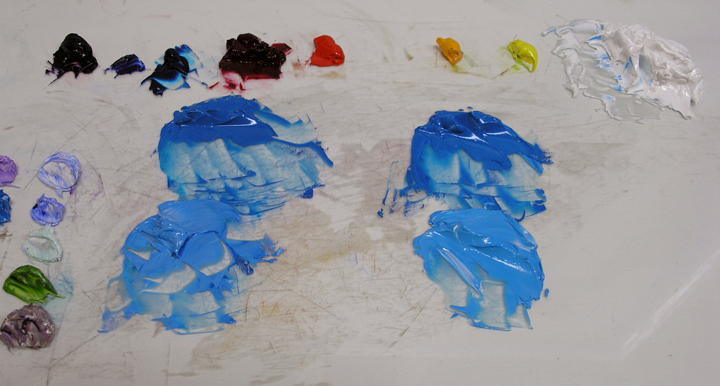 Then a couple of shades of Ultramarine Blue + White are also made. Some of that blue mixture is added at the far end of the wall on the left to make it appear as if it is dropping back. Artists work on a two-dimensional surface, the canvas, attempting to make it look three-dimensional. 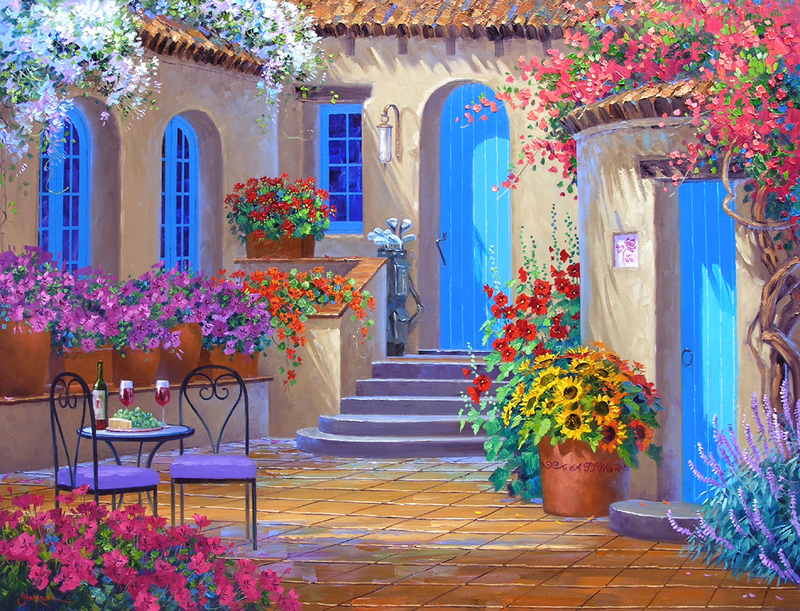 Here is a simple rule that helps to achieve that goal: Warm Colors come forward, Cool Colors go back. 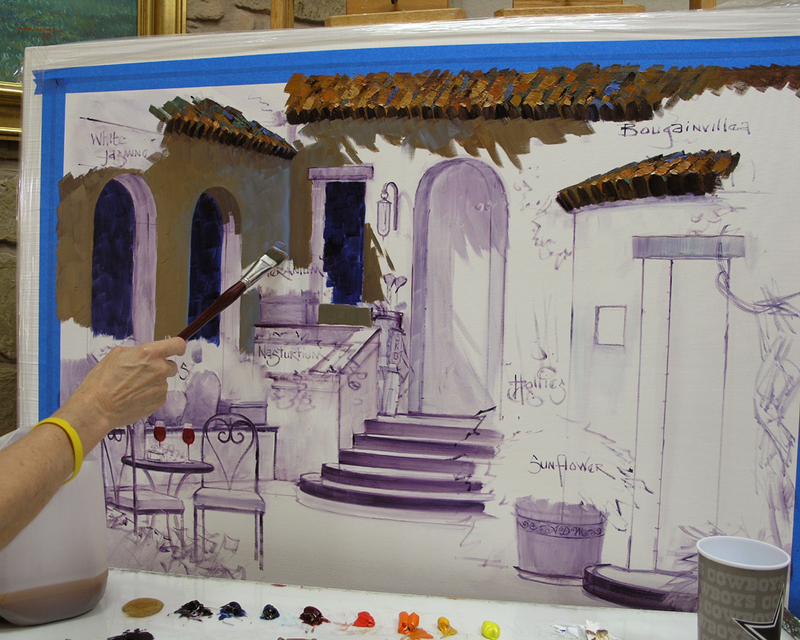 The front of the wall is painted with a warmer mixture, making it project forward. 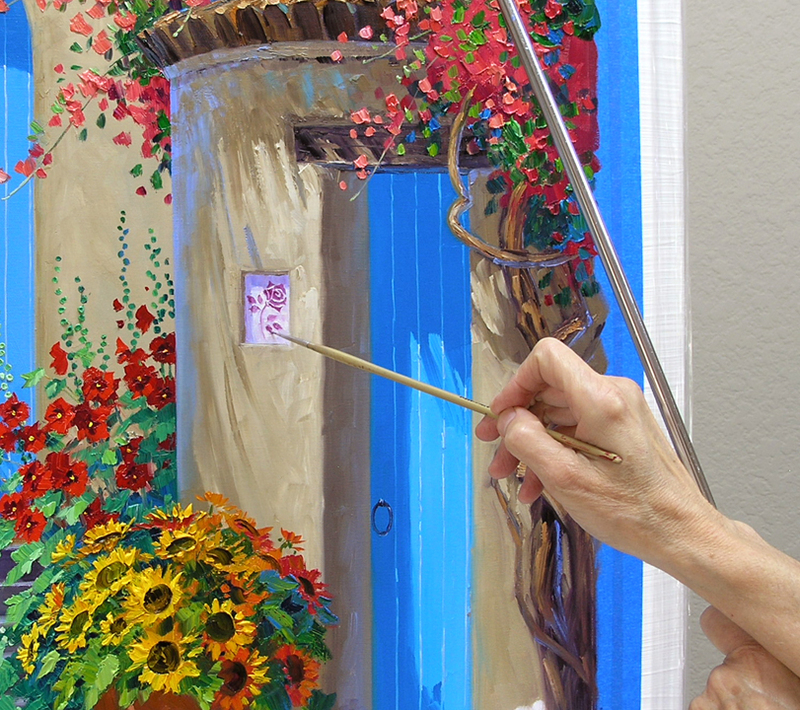 I rest my wrist on a mahl stick hooked over the top edge of the canvas to paint the lantern. This helps to steady my hand as I delineate the details. It also alleviates the strain on my shoulder. 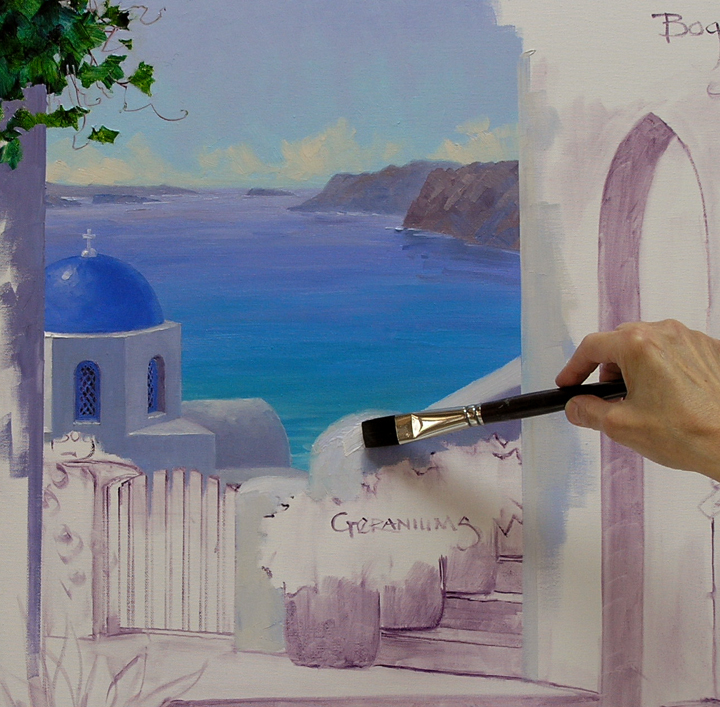 The edge of the canvas is covered with blue painter’s tape. This protects our White Senkarik Signature Frame. When the painting is finished I will pull off the tape, leaving the clean, white frame. 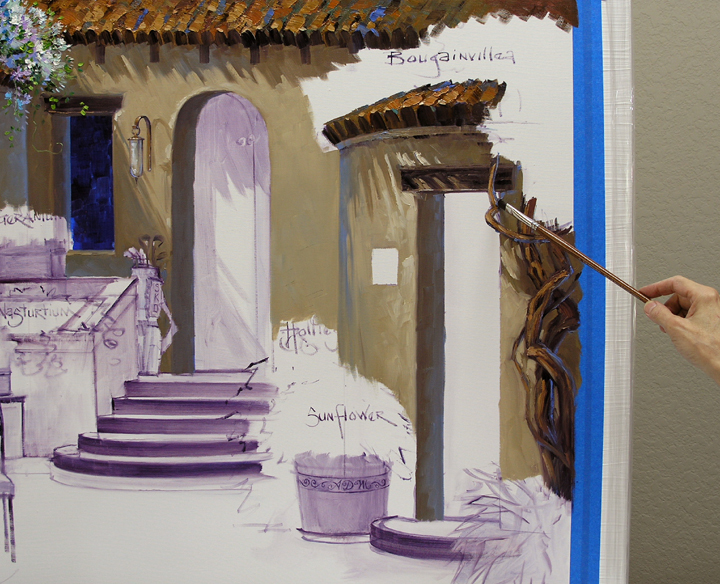 While the roof is still wet I want to work on the White Spanish Jasmine. Several different shades of lavender, blue and aqua are mixed for the blossoms. 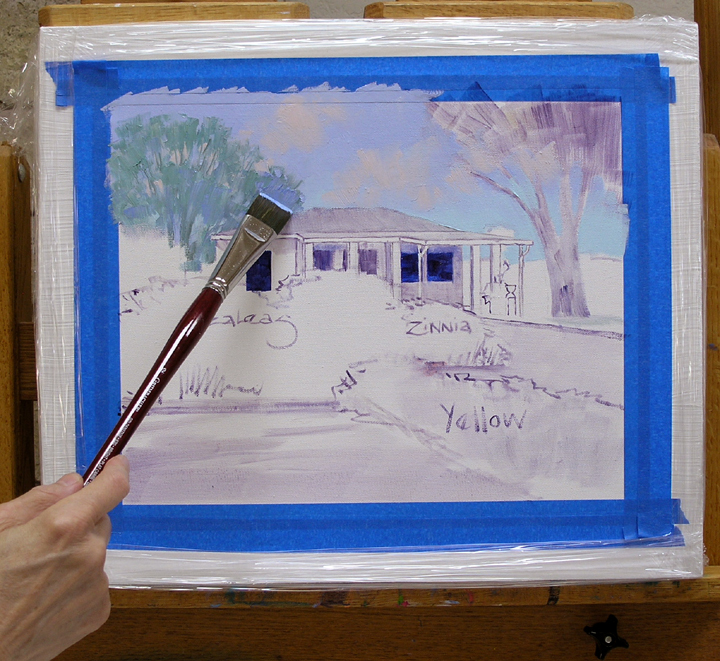 The green for the foliage is a mix of Pthalo Blue + Cadmium Yellow Medium. I block in the flower area with the various blues and lavenders. The area is covered quickly, smooshing all of those pretty colors together. I don’t want it to be smooth, the jumble of color will give the appearance of flower petals in shadow. 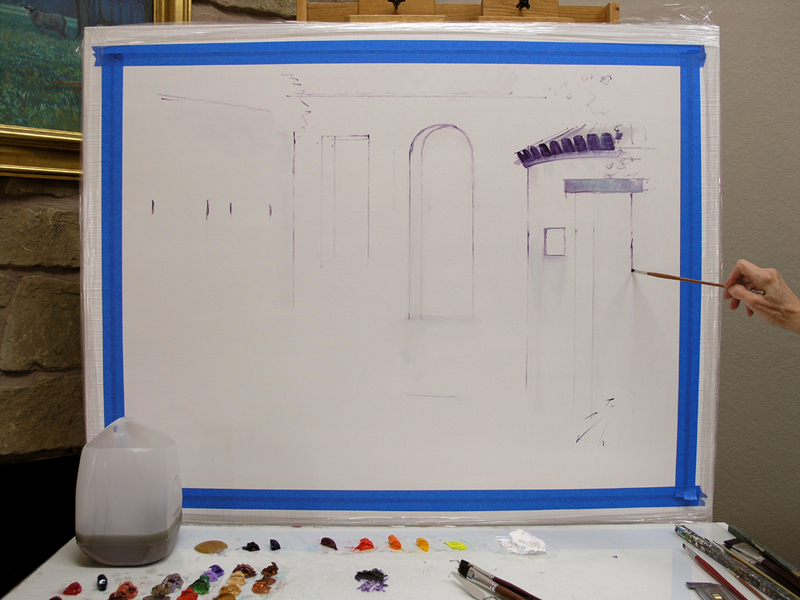 The basic plan is sketched on the canvas with a brush dipped in a thin oil wash of MUD (Ulramarine Blue + Alizarin Crimson) + Liquin. A few marks are made to indicate the windows and the placement of the door on the background building. These are made lightly so I can change them if needed. 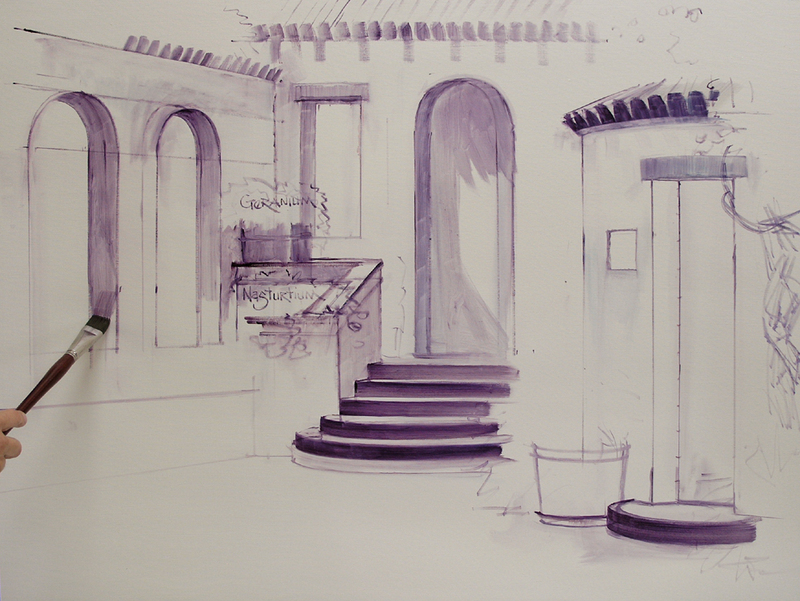 I now begin to draw the gate and wall in the foreground. 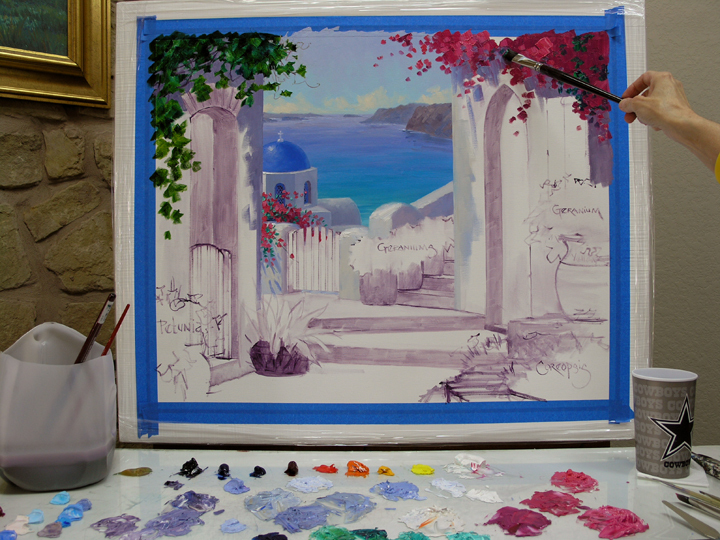 The colors for our Double Primary mixing system are laid out along the back of my palette beneath the painting. To find out more about our Color Mixing System CLICK HERE. 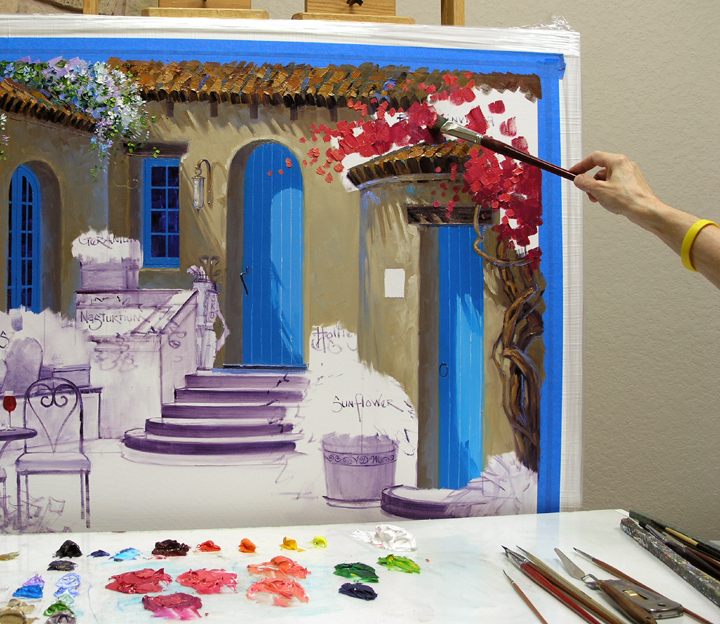 The rows of color along the left side of the palette are some mixtures I saved from my previous piece. The oil paint will be useable for three to four days. The structure in the foreground determines the proportions of the building in the background. Now that the gate is completely drawn in I can go back and begin working to establish the steps, windows and door of the distant building. I’ve reduced the number of steps both at the front gate and to the door in the distance. Many times in transferring my initial sketch to the canvas I have to make changes. As I sketch I make adjustments in proportions. You can see I’ve moved the windows on the left a little bit, made the wall along the stairs taller and widened the door.